The taste of Barley Grass Juice Powder by The Synergy Company is better than expected. Usually mix with OJ or almond milk. 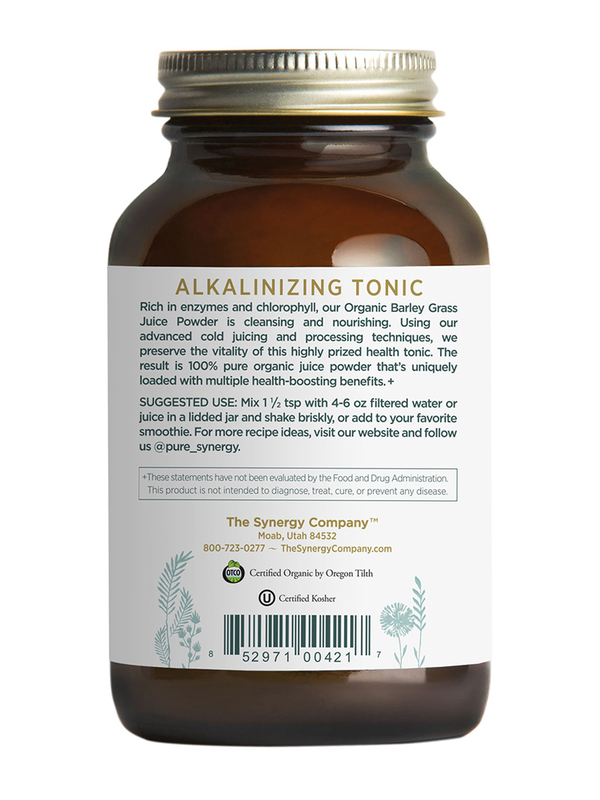 Our Pure Synergy® Organics Barley Grass Juice Powder perfectly preserves the impressive nutritional power of this superfood grass in a pure‚ vibrant powder with an invigorating flavor that mixes easily with water‚ juices‚ smoothies and can even add spark to some of your favorite sauces and dressings. 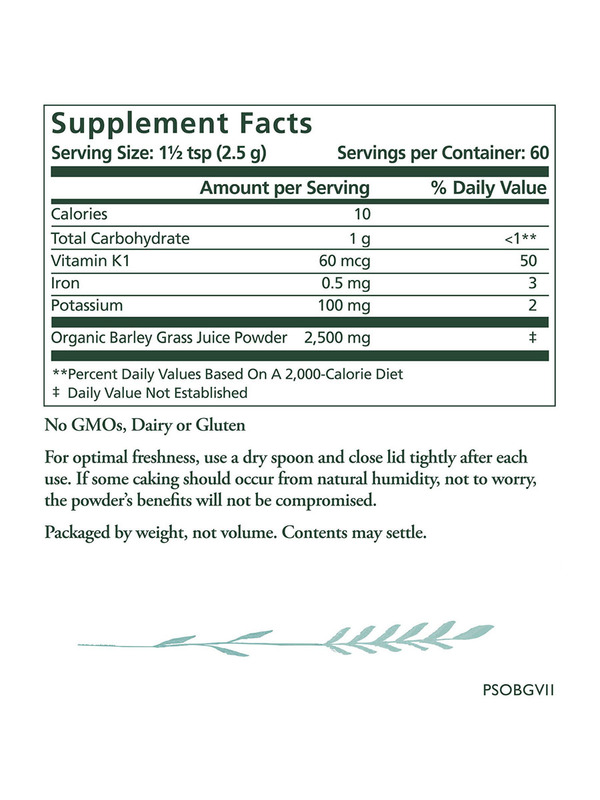 1) Similar nutritional profile and health benefits as our Wheat Grass Juice Powder with a slightly different flavor profile. 2) “Pure Juice”‚ no fiber = highly concentrated source of phytonutrients with optimal absorption. 3) In contrast to other barley grass juice powders in the market‚ absolutely no fillers‚ sweeteners‚ carriers or other unwanted additives. 4) Grasses harvested at first “joint” stage—the peak of nutritional potential. 5) Each lot tested for gluten and guaranteed to qualify as gluten free. 6) USA-grown on a dedicated 200+ acre organic farm on organically enriched soils. 7) Patented CO2 low temperature-dried through an exclusive Synergy process to retain full enzyme and chlorophyll profile‚ and to ensure freshness. 1) Rich source of chlorophyll‚ a traditional blood cleanser and builder. 2) High percentage of plant-based protein (25-35% by weight). 3) Enzymatically bioactive to spark healthy metabolic and digestive function. 4) Alkaline properties supports healthy pH balance. 6) Traditionally used for boosting energy and vitality. 7) Complete source of amino acids‚ vitamins‚ minerals‚ enzymes and chlorophyll. Many of grass juice’s known cleansing and healing effects are due to its abundant chlorophyll content. Plus grass juices‚ when grown and processed with special care like we use‚ are bursting with bioactive enzymes. One in particular is superoxide dismutase‚ or SOD‚ and it is indeed a “super” hero when it comes to protecting cells from free radical damage. Another rare natural enzyme is P4D1‚ a potent enzyme for healthy cell repair. Along with chlorophyll and hundreds of live enzymes‚ grass juice is infused with all twenty amino acids‚ making it a complete source of plant-based protein. And let’s not forget the jam-packed roster of vitamins and minerals tucked inside‚ like vitamin K‚ beta-carotene‚ iron and calcium. What doesn’t the precious juice of these grasses contain? 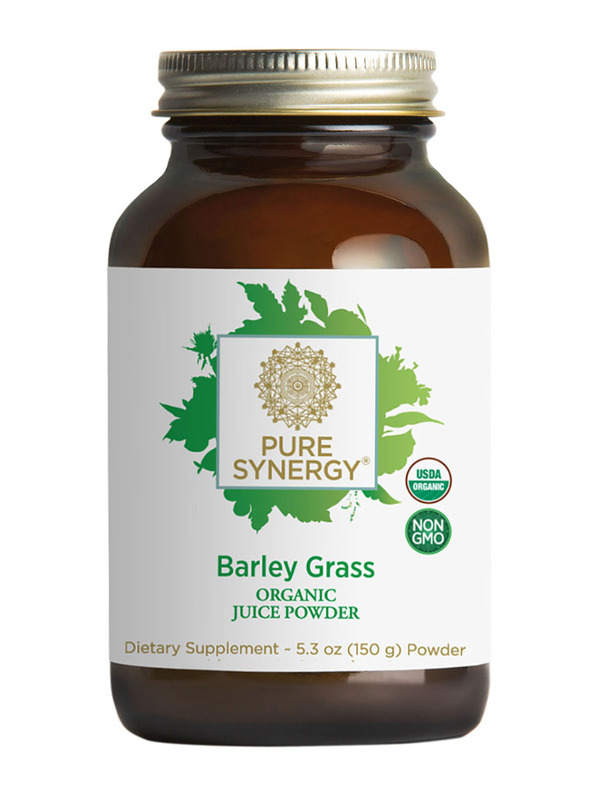 Pure Synergy® Organics Barley Grass Juice Powder is a 100% naturally occurring source of healthful phytonutrients including SOD‚ enzymes and chlorophyll. 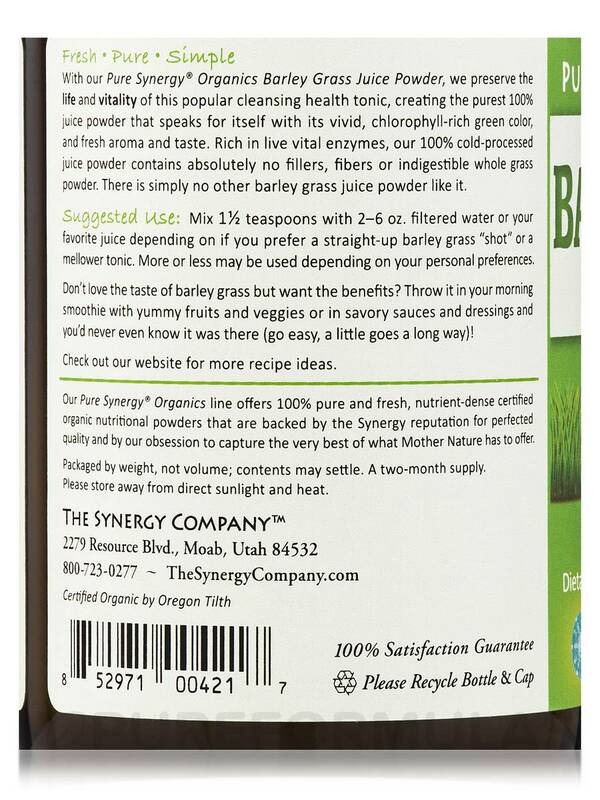 I have tried other barley juice grass powders and I really like this Barley Grass Juice Powder by The Synergy Company. Messy if you spill any. I wish the jar had a wider mouth. The company that provides this product is very quality conscious which means you will get the best benefits from the process they use. The listed benefits are excellent and I hope to benefit from them in the long run but I have only used the product for about a week now. I will be alternating the barley powder with spirulina on various days in order to get a nice balance of greens. The taste is pretty grassy when using 2 teaspoons mixed with spring water and a tablespoon of organic apple cider vinegar but when a packet of organic stevia is added it is not bad at all. I would imagine adding the barley powder to an organic type V-8 juice would work even better taste wise.